H. hillisi is the latest member of the Hyloscirtus genus of frogs, of which 37 species were previously known. These frogs like to live and reproduce around streams, and can be found from Costa Rica to the Andes of Bolivia, Colombia, Ecuador, Peru, and Venezuela. They’re also known for their elaborate camouflage and the flanging tips on their fingers and toes. Image: Darwin Núñez, BIOWEB Ecuador. The new species of frog was discovered at Cordillera del Cóndor, a sub-Andean mountain chain in a largely unexplored region of Ecuador’s eastern Andes. 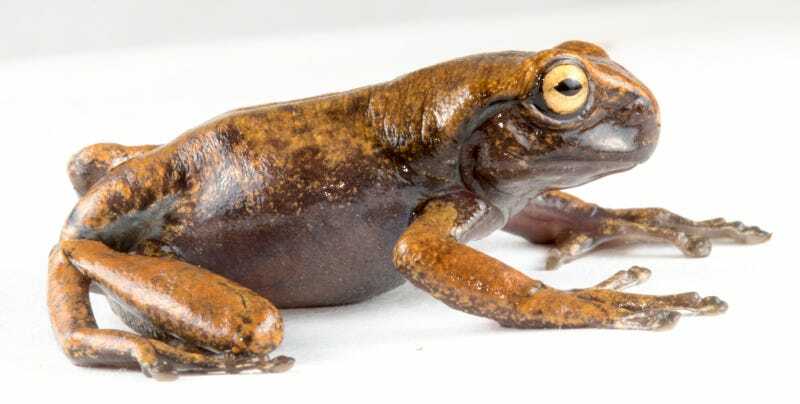 The team that discovered H. hillisi, led by Santiago R. Ron from Catholic University of Ecuador, named the new species after David Hillis, who discovered three closely related frog species back in the 1980s, also in Ecuador. Details of the new frog were published this week in the science journal ZooKeys. Alex Achig, a field biologist who helped to discover the new frog, said it took two gruelling days to climb the steep terrain to reach the top of the flat-topped mountain where it lives. A genetic and physical analysis of the frog confirmed it as belonging to a new species. H. hillisi is distinguished by its dark-brown coloration and contrasting bright orange flecks. Like other Hyloscirtus frogs, it has wide finger and toe tips. It also has an enlarged claw-like structure, called a prepollex, at the base of its thumb. 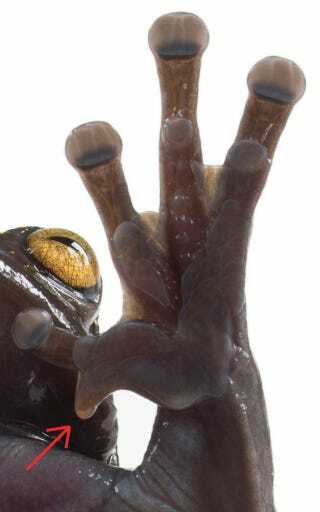 In some amphibian and mammalian species, the prepollex is a kind of underdeveloped digit, but the prepollex in H. hillisi is uncharacteristically large and rigid, appearing like a claw or spike. The function of this purported claw is not immediately clear, though the authors said it might be used in self-defense or to ward off male rivals (though on that latter point, the claw appears on both males and females).